Oh My Goodness! Oh My Goodness! 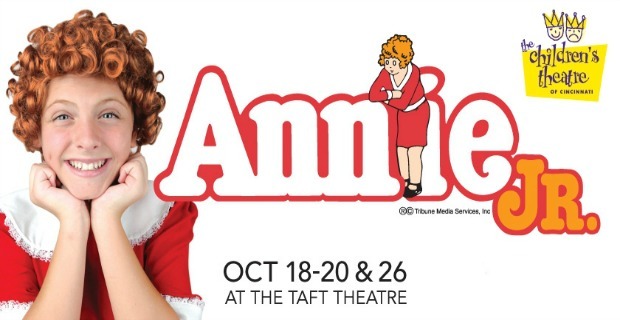 The Children’s Theatre of Cincinnati opens its 89th MainStage season with a production of “Annie JR.” at the Taft Theatre October 18-20 & 26, 2013. One of the world’s best-loved musicals features little orphan Annie who wins over everyone’s hearts. She is determined to find her parents, who abandoned her years ago on the doorstep of a New York City Orphanage run by the cruel, embittered Miss Hannigan. We are giving away a voucher good for four tickets to see Annie Jr on Friday, Oct. 18 at 7:30 p.m. Saturday, Oct. 19 at 2 p.m. or 5 p.m. We will draw one random winner on Friday, Oct. 11 at 12 p.m. The winner will be notified via Facebook and email. You have 24 hours to contact us via email or another name will be drawn. The voucher will be mailed to the winner. The voucher must be taken to the Taft Theatre box office one hour before show time to trade for tickets. Or you can call the theatre to reserve your seat in advance. Subject to availability. Disclaimer: My family was given four tickets to see Annie Jr. All opinions are 100% my own.